Facebook with over 600 million active users is the best place to start your social media marketing activities as a small business. 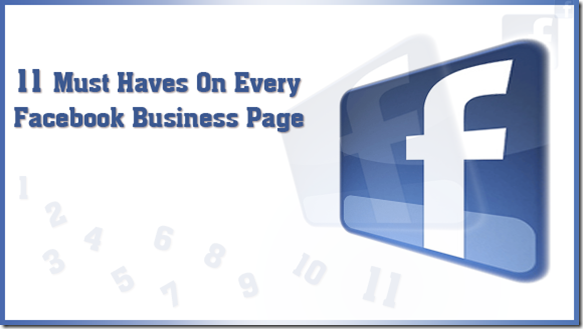 Did you know over 700 thousand businesses have facebook business page? If you do not have one , please create one and its free to create, you only need a facebook ID to create your business page. If you are worried about the privacy then good news is no one will find out who is the admin of your facebook business page. If you can include the following things in your business page, it will be a killer combination and you can win lots of new likes and eventually generate new business out of it. Think of facebook page like a website. The way your website has different pages and different addresses of each page. Similarly you can create different sub pages under your main facebook page. Then you have the option to direct your visitors or traffic to specific page, which is called “Welcome Tab”. Once you select the welcome tab, then every new user will land first on that page. You can design the welcome tab as creative as you like and run on facebook using iframe application. We all are so busy and don’t have time, therefore, give your visitor(s) clear call to action, what you want them to do when they visit your facebook page. I would say simple and one call to action is best. One call to action at one time is best. Creative and simple call to actions generally convert well. You welcome tab should include a link to your main website or blog. This will increase your website traffic. Ultimately your main aim should be to direct facebook traffic to your website. If you are local business and have a brick & mortar business, add a map to your physical location. Make it easy for your customers to find you and visit your shop or office. Actions speak louder than words, show your completed work, this is one of the most important thing you can add to your facebook page. This will make easy for your prospective customers to judge your products and services and will make buying decision super easy for them. Add discussion tab to your facebook page to answer frequently asked questions about your product or services. Once again will help customers to make their buying decision. Best way to judge the quality of any product or service is by checking what people say who used it. Make this a part of your sales process to ask reviews from your satisfied customers. I think businesses can get lot more credibility if they can use this feature properly. If you have a blog, you can import your blog posts into your facebook page using notes application. This will help you find new readers to your blog and help increase your authority if you are writing a quality posts on your blog. This is a good little handy application to automate your facebook efforts to twitter. What it does, it will send all your facebook updates to twitter automatically once installed and connected with your chosen twitter account. Videos and photos generally create more buzz in the social media. If you have flicker account and you tube channels, you can link to your facebook page to create more buzz about your business. At the end of the day this is your main marketing objective that people should contact you. Give your prospective customers as many ways possible to contact you and make those contact details visible. I hope this is enough to persuade you to have a good facebook business page and leverage the social media to get more business. Feel free to share your experiences and add more to this topic in the comments below.